Addressing the negative impacts of poor eating and inadequate physical activity. The Orfalea Fund’s Preschool Food & Healthy Habits Initiative (PFI) worked with directors, teachers, kitchen staff and parents to improve life outcomes for children. PFI helped local leaders create new norms for food and physical activity practices in Santa Barbara County early childhood education centers. Santa Barbara County experiences the same childhood obesity epidemic as other regions of the country. Early childhood education (ECE) centers often lacked a variety of needed healthy practices, along with an understanding of the context in which healthy practices exist. Examples included the lack of a thoughtful, healthful nutrition policy and practices, a weak program for physical activity, no focus on recycling or minimizing the environmental impact of waste, and families who had poor nutrition and physical activity patterns. The goal of the Orfalea Foundation’s Preschool Food & Healthy Habits Initiative (PFI) was to create “centers of wellness” in the early childhood centers of Santa Barbara County to benefit children, their families, and center staff. PFI was delivered under contract by the Consulting and Educational Services Division of the Child Educational Center, Caltech/JPL Community (CEC) in Southern California. It used the implementation design and infrastructure constructed for the Santa Barbara County Outdoor Classroom Project (SBCOCP) to deliver the new PFI content to ECE centers across Santa Barbara County. 90 centers engaged with PFI in the first two years. Initially the program was delivered by two individuals working full time and three-quarter time, respectively. A third staff person was added at 50% time a few months into the project. A 10-subject, 50-point matrix was developed and used to help centers identify their state of development as a “center of wellness.” Subject matter content of the trainings covered the broad range described in the matrix. A simple set of nutrition guidelines for food eaten in or brought into the center was fundamental to the initiative. Education was provided on subjects such as how food is grown and processed, the nutritional value of food, food additives, gardening, and recycling. 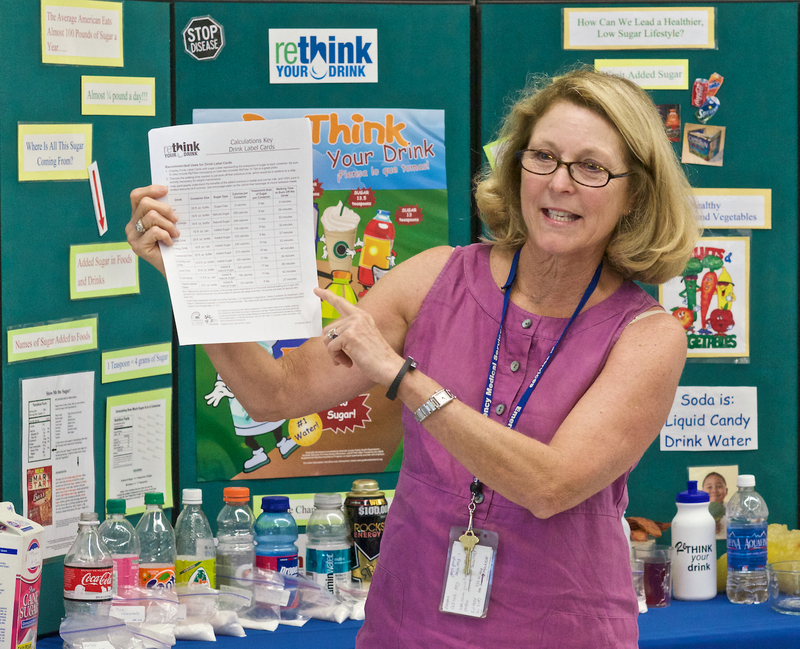 One topic was “Rethink Your Drink,” which taught teachers and parents about the amount of sugar found in popular drinks and processed foods. A special three-day culinary training was provided for cooks who prepared food for individual centers and groups of centers. Over the course of the first four years, slightly more than 90 centers had staff that completed the full six-part training series. The targeted 450 center site visits were accomplished. Positive changes were achieved on the averages for all ten sections of the initial matrix. Changes in the averages for the elements in the shorter, more focused matrix were more dramatic. On average, centers made significant improvements in quality of food served, recycling, and gardening. Of particular note were changes in eating and activity patterns of children’s families. Sustaining both PFI and SBCOCP beyond the sunset of the Foundation has been the final focus of this seventh year of the combined SBCOCP/PFI endeavors. This work has involved establishing and developing the leadership of the Demonstration Site Network Steering Committee and expanding the base of Demonstration and Recognized sites. As part of this activity, the Committee and the centers understand that their responsibilities include sustaining both the PFI and SBCOCP endeavors. A mentoring program has been established to facilitate support for less developed centers by those that are more developed.